Our Audio Recorders are an important addition to audio surveillance equipment, as they can connect to our audio surveillance receivers and record all listening devices and audio transmitters off the air. This enables anyone who conducts audio surveillance to be able to store audio intelligence as evidence. Our Audio Recorders store over 560 hours of voice conversations internally. 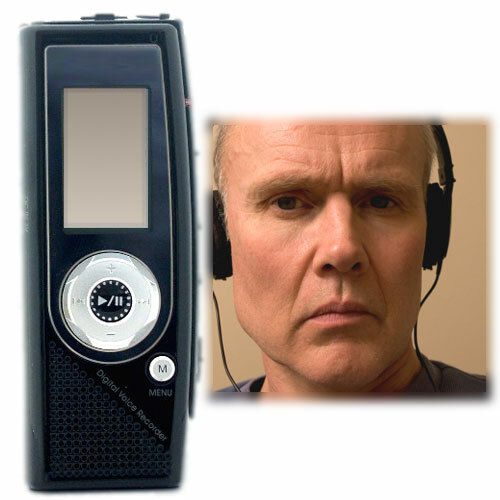 When we first offered this 2GB Digital Audio Recorder, we knew it was a 'must have' surveillance gadget that would complement most of our audio surveillance equipment. Indeed, the ability to record volumes of audio surveillance from surveillance receivers is appealing. Now you can save all audio intercept records from listening devices and audio transmitters. Simply connect the audio output on your surveillance receiver to the microphone input on your audio recorder and you are ready to store your surveillance logs. Unlike other Digital Audio Recorders, the 2GB Audio Recorder can store an enormous volume of conversations. AC Power: AC adaptor supplied in order to operate the Digital Audio Recorder endlessly without using battery power from a 110 Volt mains power. AC Adaptor: Supplied for use with 110Volt mains power.